Only a couple of days till my early morning flight to Melbourne. Bike is back from the mechanics and is now all set for the trip. 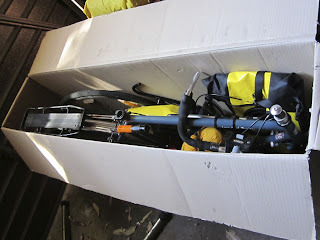 Boxed the bike and most of the gear up over the weekend and will do my final packing this Friday. She is boxed and ready to go ! When I get to Melbourne the plan is to assemble the bike and ride through to Lilydale. From there I'll get on to the rail trail to Warburton. Depending on the time of day and how I'm feeling will either stop there for the night or push on to Marysville. Really looking forward to this trip. Just hope the weather settles down a bit, as last weekend in the Snowy Mountains they had a late dump of snow. < 2 weeks to go....and the bike is at the mechanics! !